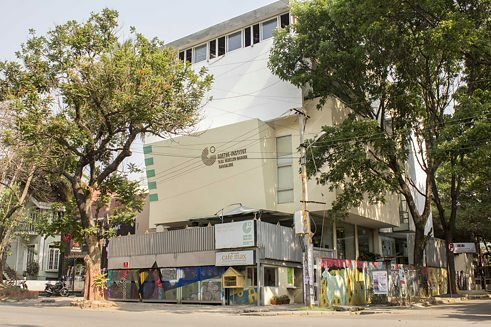 The Goethe-Institut / Max Mueller Bhavan Bangalore, (founded in 1960) offers language courses, organises cultural events and has a Library. We determine our main areas of interest in consultation with our Indian cooperation partners from the fields of art, science and media, from NGOs and select companies, with whom we jointly develop appropriate programmes and projects. Our activities range from film screenings, exhibitions, theatre performances and concerts to workshops and conferences particularly on innovative topics such as video and media art. Since we keep abreast of cultural and artistic trends in Germany, we are able to provide the latest information about the country. The institute also initiates and organises contacts and study tours for Indian artists, scientists and journalists who wish to go to Germany. We would like to support them in their roles as promoters of culture and pave the way for future international and cultural cooperation. The bangaloREsidency is designed to involve mutual exchange so that both the visiting artists from Germany and the local community reap the benefit of fresh perspectives and expanding horizons.